Over the weekend, my buddy Bernard and I were discussing a memory of growing up in pretty much anywhere in small town Canada. For people of my generation, a trip to The Pop Shoppe was a fun and regular occurrence. Unlike traditional pop, and before the time of so many store brand pops, there was The Pop Shoppe. The Pop Shoppe back home, was, at least the only occasion I remember, down on Memorial Drive in Clarenville, just about right across from the medical center. There was a hair salon in the same building in later years. They operated on an interesting business model, franchising stores to people, and selling their own product in refillable, returnable glass bottles. You’d get your product in cases of 24 and once done you’d return your bottles and get your deposit back or put towards your new case. What was best about it though for the kid in me, was the assortment of flavors. There were the usual copy cat ones, Cola, Lime Rickey, Root Beer, Sparkle Up, but by far the best, and maybe the best pop ever was Black Cherry. Atlantic Superstore here used to sell a store brand black cherry flavor, but its no longer available, and while The Pop Shoppe has been reincarnated, I don’t see it for sale in any local locations, but man was Black Cherry ever good! 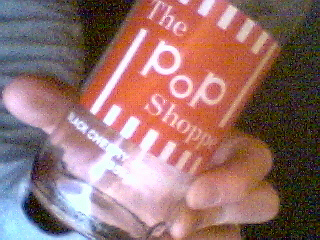 Another unique feature of The Pop Shoppe were the stubby bottles, like the old stubbies we used to get beer in back in Newfoundland, except clear and with The Pop Shoppe branding painted directly onto the glass. Once the local one closed up, I still had some bottle laying around and for a time reused them to make Hire’s Root Beer from the little bottles you could buy at the co-op and Mercer’s. Though I think as many of those exploded as were consumed, but that too was a great pop, and Hire’s, in my mind, while it and Crush were still independent was the best root beer I ever drank.